Get up and running fast with the basics of programming using Java as an example language. This short book gets you thinking like a programmer in an easy and entertaining way. 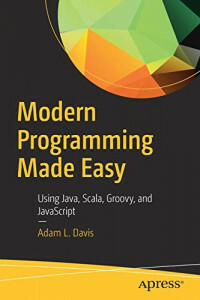 Modern Programming Made Easy teaches you basic coding principles, including working with lists, sets, arrays, and maps; coding in the object-oriented style; and writing a web application. Anyone who wants to learn how to code. Whether you're a student, a teacher, looking for a career change, or just a hobbyist, this book is made for you.